CSMS Magazine » The meeting in Montreal: A photo-op? You Are Here: Home » Editorial » The meeting in Montreal: A photo-op? The meeting in Montreal: A photo-op? As in all international crises or natural disasters, donor countries are always felt compelled to show a sense of humility and responsibility. In the case of Haiti, a small Caribbean nation being severely crippled in the aftermath of a devastating earthquake, the urgency to act or do something is all the more urgent. Haiti’s case is distinct, for this is the first time in modern day history, an earthquake struck and put out of commission the entire functioning government of a country, living more than 200,000 dead or severely injured and more than a million survivors homeless. The world sympathy and outrage is immeasurable, and despite global effort by private citizens and NGOs (Nongovernmental Organizations) to help ease the suffering, everyone agrees that only strategic planning by an effective and responsible Haitian government wholeheartedly supported by friendly nations can help Haiti rebuild with dignity and efficacy. So the Monday’s meeting in Montreal—although it was supposed to lay the groundwork for a future Marshall Plan for the country—looked more like a photo-opportunity rather than a genuine effort to jumpstart the rebuilding process. 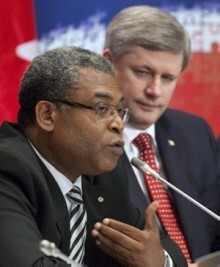 Among those attending were Canadian Prime Minister Stephen Harper, US Secretary of State Hillary Clinton and French Foreign Minister Bernard Kouchner, representing the four major Haiti’s backers along with officials from a dozen other nations, like Brazil, Chile, Costa-Rica, Japan, The Dominican Republic etc… The meeting began with an urgent plea by Haitian Prime Minister Jean-Max Bellerive (seeing here in the picture along with Canadian Prime Minister Stephen Harper), who asked the donor countries to stand behind Haiti’s massive reconstruction. ”I just want to say that the people of Haiti will need to be helped to face this colossal work of reconstruction…… The government of Haiti wants to assure the entire world that it will remember and be worthy of the exceptional sympathy that it receives,” Bellerive told international officials as the closed-door session started. Bellerive seemed to have misinterpreted the worldwide outpouring of support. It is not being directed at the Haitian government that is highly noticeable by its impotence, its complete subjugation by Washington and, even before the earthquake, was never worthy of responsible governance. The Préval government has always been reputed as being slack-offish for its aloof demeanor, its outright passiveness embodied in the Head of State himself. This was obvious yesterday in Montreal, when the Prime Minister brought nothing in concrete as to how his government perceives the rebuilding effort should be. Instead, he embarked upon a string of merciless demands reminiscent to the traditional politician, petit-bourgeois Port-au-Princien with no sense of dignity when it comes to beg for money. If Haiti has to survive and thrive out of this sinkhole, it won’t be Préval and his cronies that will lead the way. They will simply not be up to this seemingly incredible task. There is a steep mountain to climb before reaching the plateau of decency, financial stability, true political independence and social justice. It is true the Motherland is not in life support, but it is also true that it is in critical condition. Only genuine compatriots with no selfish interests but with profound patriotism and the wherewithal—in intellect and in logistics—will be able to take our country out of this deplorable dilemma. Sadly enough, there are those who thrive in filling their lots by exploiting the abject poverty of their fellow citizens. To them, this latest catastrophe, believe it or not, is a welcome event as they foresee millions of dollars of profits in the coming years. Meanwhile, a team of Canadian and Haitian aid organizations has called on donor countries to cancel Haiti’s foreign debt, which is estimated at more than one billion US dollars. “We hope that you use the weight of your governments to convince international financial institutions to cancel Haiti’s entire foreign debt,” said Eric Faustin, director of Rocahd, the Coalition of Canadian-Haitian Development Organizations. The umbrella group was using the groundswell of support for Haiti as many hope to tackle grinding poverty in the country. Representatives of the European Union, the Organization of American States, the Inter-American Development Bank, the World Bank and the International Monetary Fund were also present. There is a sense, among the donor countries that Washington is pursuing its own hidden agenda, regardless of what the common plan for Haiti will be. In the wake of the devastation and while the whole world is rushing to help, Washington was responding by sending thousands of its marines to control key installations in the Haitian capital, including the airport, the presidential palace and the Port-au-Prince harbor. Doing so, it controls who lands in Haiti, and who does not. Hillary Clinton’s visit in Port-au-Prince last week was a diplomatic mission aimed at securing US military presence or perhaps at dictating Préval to rubberstamp the legality and legitimacy of The United States military presence in Haiti. Soon after Hillary’s visit, Haitian ambassador to Washington, Raymond Joseph, was ordered on the air on the Voice of America to tell his fellow countrymen in Creole not to try to take to the sea, for they will be arrested and sent back immediately. Rumors circulated that the infamous Guantanamo prison was going to be used to house desperate earthquake refugees. Although it is difficult to confirm these rumors, but it is clear this large troop deployment off the coast of a deprived country not at war with anyone is designed to preempt any possible mass exodus by desperate Haitians fleeing their hellish conditions. Forestalling any refugee influx is strategically necessary to the Obama administration now in the middle of a pitch battle with his republican counterparts in a midterm election year. The United States, in the midst of a major recession at historical proportion, can ill afford to finance its major wars in both Iraq and in Afghanistan, let alone financing the billions of dollars that will be required to rebuild the Haitian capital. As an earlier conflict like in Panama, in Kosovo etc…, it was always outright deception that greeted those who were promised Jesus in Paradise, like Guillermo Andara, who replaced Manuel Noriega in Panama. He had to resort to prayer and fasting to salvage his image before the Panamanian people. Haitian officials in Port-au-Prince should read their history books. US military presence in Haiti is already causing open criticisms from the European Union. Yesterday French diplomats in Brussels were forced to say that “this is about helping Haiti, not about occupying Haiti.” Since the US landed there at the Airport, aid groups and other countries have complained that vital aid could not land because the US military had priority. Guido Bertolaso, the head of Italy’s Civil Protection Agency, denounced the US-led effort as “pathetic,” and compared it to the response to Hurricane Katrina in New Orleans. Bertolaso, a cabinet-level official who won praise for coordinating relief efforts after the 2009 earthquake in the central Italian city of L’Aquila, said of the US response, “It’s a truly powerful show of force, but it’s completely out of touch with reality. They don’t have close rapport with the territory and they certainly don’t have a rapport with international organizations and aid groups,” he said. These criticisms were shrugged off by Secretary of State Hillary Clinton, who insisted that the US was leading an “enormously committed and effective international effort that could not succeed without additional military assets.” She pointed to the arrival of the US Navy’s 1000-bed hospital ship, the USNS Comfort, but failed to mention it did not arrive until eight days after the quake, while tens of thousands were dying due to the lack of medical resources in the poverty-ravaged country. But ultimately, it is going to be up to a Haitian leadership to decide the faith of its people. This current one, however, is out of step with reality. A government that does not even have the minimum decency and any sense of humility with regards to show respect for its own dead as they were being dumped in shallow mass graves with pile of bodies being left to rot in the sun, and that declared the search-and-rescue operation is over while people are still being pulled out alive from under the rubble—the latest one this morning—is clearly an abomination, a crime of high treason and a gross violation of the people trust. These images were being parading on CNN and in all major news organizations, and it takes great pain for anyone to watch, let alone being a Haitian. How does one show respect to the Haitian government? As Haitians, can’t we do better than that? Shame on Préval and his band of fripouilles, who claim to be at the driver seat of the land of Dessalines.